OK, so, here’s the drill: It’s time for you to come up with a song title, e.g., “I Came to Take You Out to Lunch, But You Already Were” (sorry, already taken by Vermont’s own The Oleo Romeos) or a theme, e.g., “Conspiring with a woman to kill her husband” (sorry, also already taken by Vermont’s own The Oleo Romeos). I’ll keep collecting data through Friday, August 1 (not to be confused with Burlington’s premier café/bakery). Over the weekend, I’ll figure out the topmost titles or themes, and then on Monday, August 4, I’ll have the run-off vote where you pick from the top 3-5. Sorry, the first round’s over, but there may still be time to vote in the final round. 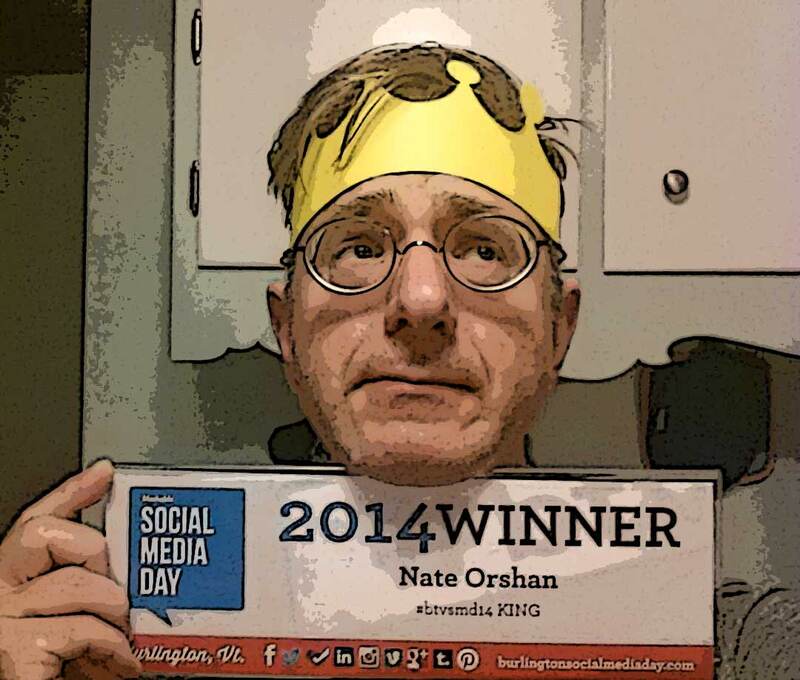 So yesterday I won the fifth annual Burlington Social Media Day “2014 Social Media Royalty > King” award. It was a great and not-entirely-unexpected* honor, so, as you might by now expect, I was prepared with a song for the occasion just in case, knowing that would make my acceptance speech** a little unusual. What was more than a little unusual was that, in a room full of social media mavens, NOT A SINGLE ONE OF THEM SEEMS TO HAVE RECORDED MY PERFORMANCE. These are people for whom, presumably, entertaining or unusual content is as fundamental to their online presence as a windsor knot is to a Wall Street banker***. In retrospect, maybe I shouldn’t have told them all they had to clap along. Who knew social media mavens love to clap along? So once I got home, I dusted off my shiny new crown**** and tried, tried again. Burlington Social Media Day is the brainchild and labor of love (ain’t no money in it) of Lara Dickson, a graphic designer with serious online communications chops, who moved to Vermont around the start of the tens. Having been inspired by Mashable, she and Anna Palmer organized the first one on June 30, 2010, and at this point it’s becoming a real Queen City tradition. …So it’s late, and I’ll finish this blog post this weekend (including details about the process whereby you all are going to tell me what song to write next…) So here’s how you can tell me what song to write next, but for now, I’ll leave you with the lyrics, which pretty much say what I’d want to say if I could write lyrics. * I did sorta campaign hard for it. And promise everyone I’d write whatever song they, in the aggregate, decided. More on that above. ** Once the awards ceremony kicked off, I saw that people don’t usually get to say anything after they’ve received their award. But did that stop me? **** Yes, I did get a crown, but it’s made out of flimsy paper, just like my social media skills. It didn’t win and didn’t even place, but, 16 years later, here’s the song I submitted for Vermont’s State Song Competition. It’s called “Vermont, My Own True Friend”. The last criterion was the “music-y” part, and I imagined that any state song would end up being sung by crowds of people in classrooms, ballgames, and the Statehouse. Never mind the song’s language or symbolic content; above all, the song had to be designed to be performed by multiple people, with average ears and voices, yet still sound stirring and anthemic. That meant it needed a more structured meter and some larger-interval (but not TOO large!) leaps at the right point to catch attenton. A big inspiration was Maine’s state song, which my fiancé (now my wife) used to launch into spontaneously. That was another hope for my song’s musicality: It should inspire the singer to swing their bent arms back and forth in front of them, as if they were so inspired that they wanted to march in a parade. In case you’re wondering, here’s the song that was selected as Vermont’s official State Song, “These Green Mountains”, words and music by Diane Martin and arranged by Rita Buglass Gluck; this rendition is from Victoria Tomkinson with Bob Ray on guitar. Here’s a more gussied-up version performed by the Vermont Youth Orchestra Choir at the Statehouse. As far as the words go, I’d like to think they met my criteria. I’m grateful to be able to say I live in this wonderful state, and I hope I can continue to do so for a long time to come. “granite” – I may be going out on a geological limb here. “salmon” – Yup, we got ’em! “unity and freedom” – OK, so our state motto is actually “Freedom and Unity“, but sometimes ya gotta mix things up a bit to get a line to fit.